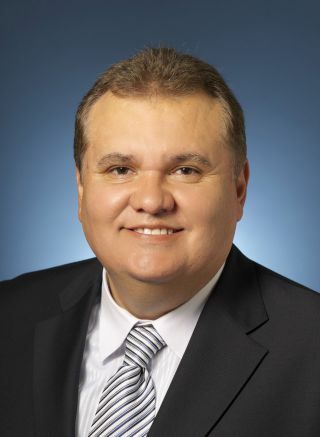 Jose Alvaro Avalos: I am the general manager for Intel’s visual retail organization and vice president in the internet of things (IoT) group at Intel. In this role, I am responsible for driving Intel’s strategy, focus, and business in digital signage, kiosks, and intelligent whiteboards worldwide. Intel processors are the brains that sit inside, behind, beside, or under the majority of these products. My team works with our partners and customers throughout the world to help them use Intel processors and technologies to bring exceptional experiences to their customers. We help our partners optimize their products and connect with others who can complement their capabilities to deliver the best possible solutions. JA: I established the visual retail business at Intel in 2009, and have been running the business ever since. Prior to this role, I served Intel in various general manager and director-level positions across different businesses including ultra wide-band technology for wireless USB and consumer electronics devices. JA: I have a hybrid engineering and business educational and professional background; I have always focused on businesses with international footprints. Thus, my background prepared me well for this role. JA: Our short-term goals are to continue to help the market understand the value proposition of moving from posters to digital signs, the value of adding self-service kiosks, and the benefits of intelligent whiteboards. Along with that, of course, our goal is to also explain the value proposition of deploying these solutions with Intel products and technology. In the long run, it’s about how we continue to make the signs more responsive, more aware of their environment, to create an even more personalized experience, and make them ultimately think for themselves. There is a lot of talk about analytics and artificial intelligence (AI) in this market, but the actual deployment, and active use of the data collected, is still in the early phases. As the Intel processor capabilities continue to increase, the capabilities that our ecosystem can offer will continue to expand and grow. That leads to our most important goal—to help our customers solve their customers’ biggest challenges. By doing this, we will develop solutions that are responsive to consumer needs and effectively improve their lives. JA: My greatest challenge these days is how to best work with a very large and continually growing ecosystem of customers and partners. We know that the systems contractors and system integrators are key decision makers in the value chain, and we are looking to enhance our relationships and more formally align with them. Our objective is to enable system integrators to create market-ready solutions that effectively address the needs of the industry. SCN: Where do you see the digital signage market heading? JA: More interactivity, more functionality, more personalization, more analytics, more AI—basically more of everything! And, Intel is working with the industry to help bring these enhanced capabilities to market. We believe that accountability is key to driving more market adoption—making sure brands are able to place their ads in the right locations and at the right times; they need to be able to utilize this strategy to reach their targeted audiences in a meaningful way. The industry is actively working to come up with ways to make this happen, and Intel is driving this through our extensive partner ecosystem. We plan to continue to develop and deliver innovation through IoT-designed, market-ready solutions. SCN: Are there new initiatives we are likely to see from Intel? JA: Intel has been very public about our role in (and the value of) data, analytics, and AI. We have core capabilities, including software and hardware reference designs we’re bringing to the market, to help solve the challenge of deploying IoT faster and easier; especially in the retail, restaurant, healthcare, education, hospitality, and transportation industries. We believe the digital signage market is the perfect consumer for new and innovative capabilities. One prime example of this is the Intel Smart Display Module specification and reference design that a number of display and media player manufacturers are productizing now. Finally, Intel is always looking for ways to work with our ecosystem to extend our capabilities to new use cases and market segments to help solve new challenges. So, stayed tuned—there will be many more innovations and initiatives to come! JA: If a system contractor isn’t aware of the Intel value proposition, please let us know! The more you know about Intel capabilities, the better you can position yourself to win business and be more profitable. For example, some Intel processors include a capability called Intel vPro technology that allows the integrator to resolve more service calls without having to actually visit the site. Most management tools work great as long as the operating system can boot, but as soon as the system won’t boot, a site visit is almost always needed. Intel vPro technology works beneath the OS and can resolve the vast majority of software issues causing a system to not boot. This saves on service calls, making your service contracts much more profitable. There are many more benefits of Intel processors and Intel technology; our team is readily available, just reach out and let us know if you would like to know more.